Recently, Prof. LI Yue from Institute of Solid State Physics (ISSP), Hefei Institutes of Physical Science, made a new progress in the dynamically tuning of the interparticle gap of Au dimers used for colorimetric sensing applications. This related result has been published in Advanced Functional Materials. In the past decades, by taking advantages of such dispersion and aggregation states of Au NPs, scientists reported a number of Au NPs colorimetric sensing platforms for the detection of different analytes based on visible color changes by the analyte stimuli, i.e. toxins, heavy metal ions, and food additives. However, the assembly and disassembly of Au NPs triggered by analytes were usually random and uncontrollable, and the aggregation of Au NPs suspended in solution were usually unstable. Consequently, it makes a great challenge to develop a Au NP-based colorimetric sensor with high sensitivity, long-term stability and having a dynamically wide tuning sensitive range. 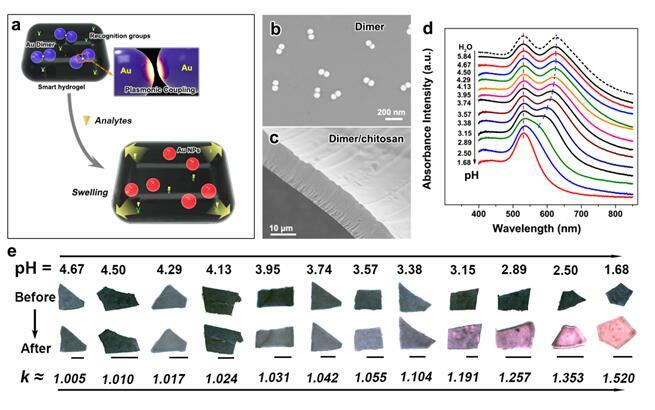 To overcome such challenge, LI’s group developed a novel Au dimer-based colorimetric sensor by using the dynamically tunable gap-dependent plasmonic coupling properties of Au dimers. This kind of colorimetric sensor exhibited a high optical sensitivity, since the interparticle gap and PC peak shift of Au dimer can be precisely and extensively controlled through the pH-driven volume change of chitosan hydrogel film. Moreover, this colorimetric sensor can avoid the Au dimers from the natural aggregation, which makes them rather stable for a long-term storage. More interesting, the sensitivity of Au dimer/chitosan sensors could be further adjusted by simply tuning the crosslinking degree of chitosan hydrogels, resulting in a more widely dynamic tuning range for sensing applications . The Au dimer-based colorimetric sensing strategy paves a new way to achieve the high-quality colorimetric sensor, which has important applications in facile colorimetric detections for different target analytes with ultra-high sensitivity, stability and with low cost. This research work is supported by the National Key Research and Development Program of China, Natural Science Foundation of China, the State Key Program of National Natural Science Foundation of China, and the Anhui Provincial Natural Science Foundation.